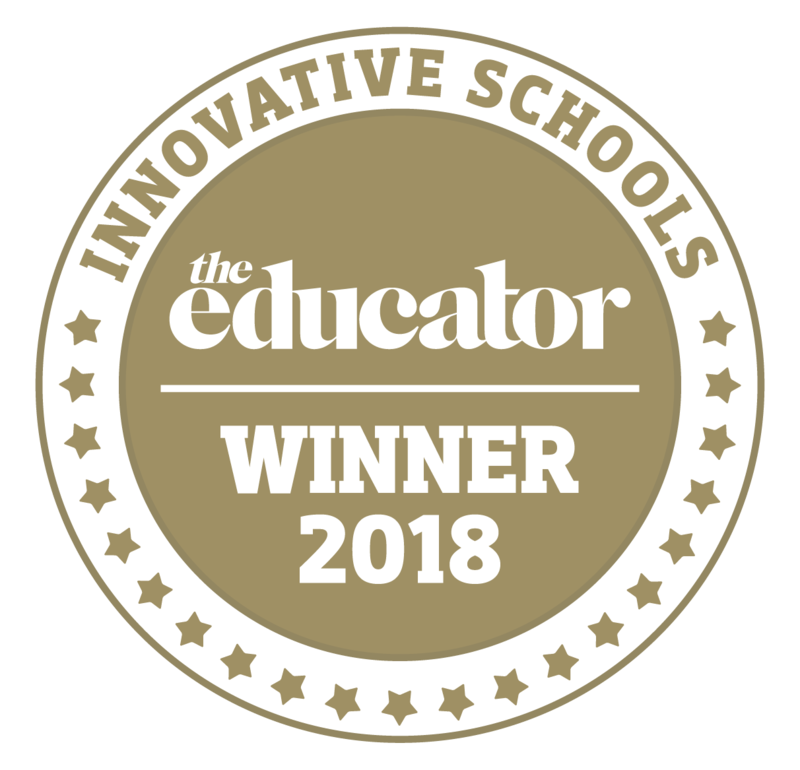 On Monday, The Educator’s Innovative Schools Awards 2018 were announced and Brighton Grammar’s iDesign program was recognised as a leader in innovative education. Under the leadership of Jamie Watson, for eight years now, our Year 8 students have participated in iDesign, an initiative that involves critical and creative thinking, innovation, sustainability and entrepreneurship. iDesign provides students with an opportunity to demonstrate independence and originality, to plan and organise a significant project over a relatively long period, to experience working with a mentor, and to practise some of the skills they learn from that mentor. No matter what their level of academic achievement, through iDesign, our boys can highlight their individuality and inspiration. Currently, our Year 8s are working to complete their iDesign projects for presentation in mid-October. I encourage all members of the BGS community to come along to a public viewing session to see how our boys are being prepared for the 21st century. Keep an eye on the eNews and SchoolStream for further details. The magician, the sage, the warrior and the caregiver – these four archetypes, chosen by the senior students as representations of those patterns of behaviour required to become a ‘good successful man’, are referenced often within the senior student body. Each student in the Secondary School has spent time reflecting on how elements of all the archetypes are present within his own character. The 9/10 B2M program launched last year is based around these archetypes. The ‘service’ component encourages the boys to think deeply about the ‘caregiver’ archetype. One event in particular challenges the boys to see themselves within a wider context and to consider what they can do for others: Connor’s Run. This year, the run will be held on Sunday 16 September. Connor Dawes was a Year 11 student at BGS in 2011 when he was diagnosed with a brain tumour. He continued at school, when he could, throughout his Year 12 year. Connor passed away in early 2013. Connor’s Run holds a special place within the BGS fundraising calendar and has now become a lynchpin of the B2M program. While the students are split into groups for many other components of B2M, they take part in Connor’s Run as a team. Every Year 9 boy is involved, whether he’s doing the run on the day, fundraising for the RCD Foundation or supporting the event by volunteering his services. Last week a group of our boys (pictured around Connor’s Mum, Liz) packed the 4,000 participant showbags, ready to be distributed to the runners in preparation for the Run. After the event, the boys’ sense of wellbeing is heightened; not only have many of them challenged themselves physically, they have supported their peers, developed their leadership skills, been part of a community team and contributed to a wider cause. For the Year 9s in particular, this is much more than a run. Last week, the Music Department presented informal soirees for both our Woodwind and Vocal students. Each performance comprised a dozen or more students, ranging from Year 3 to Year 12. 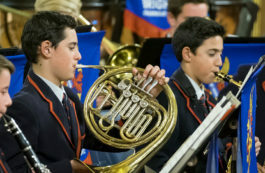 Informal concerts and soirees provide the boys with a great opportunity to perform as soloists and in small groups – an important contrast to participating in the larger bands and orchestras at BGS. They also gain valuable experience working with an accompanist and developing their performance craft. On behalf of the boys and the Music Department, I would like to thank all of the music staff for their work with the boys in preparing for these performances. Particular thanks to our Coodinator of Woodwind, Ms. Helen Hardy, our singing teacher, Ms. Christine Heald, and the school accompanist, Mr. Isaac Mouskovias. The Brass students have also been busy polishing their performances, and hopefully their instruments and shoes, for the upcoming Brass Soiree on Tuesday 18 September, which will be the final instrumental soiree in what has been an extremely busy term for the music students. The Music Department are extremely fortunate to have a dedicated and passionate team of parents who support the music program at BGS in many ways, including volunteering in the music library, providing refreshments for the boys at selected rehearsals and recitals, and helping with concerts and other performance events. A few years ago, the Friends of Music set themselves an ambitious target of raising $8,000 to purchase a new bassoon for the school. Through the wonderful support of the BGS Music Community, they have been able to reach that target within only three years, and were able to present the new bassoon to the School at the Strings Spectacular concert on Tuesday night. Thank you to the Friends of Music Parent Group, led by Mrs. Suzanne Dow, and to all of the members of the BGS community for your ongoing support of the music program and students. Back Row: Ross Featherston, Richard Galvin (FoM Stage Crew Coordinator), Tim Langdon, Jared Furtado (Director of Music), Kurt Abell (Acting Head of Instrumental Music). Front Row: Wai Ling Lee, Suzanne Dow (FoM President), Felix Gong (Captain of Music), Sherry Dong. Recognition for performance, effort and commitment in sport is highly valued by the BGS community. As part of the BGS Sport ‘Awards and Recognition Program’ all boys in all sports have access to various forms of recognition through multiple platforms. Boys provide match reports at assembly, sports reports go on the website, boys are recognised across our social media platforms, participate in sports presentation nights and receive colours and honours at seasonal assemblies. We value the efforts of all of our teams and individuals. Engagement and contribution to sport is also recognised through our important ‘Service Awards’. These awards acknowledge outstanding service to a particular sport, over an extended period of time, or in that season. Congratulations to all of the boys for their performances over the Winter Season. All VCE Geography students are required to undertake field work. Last Friday the Unit 2 Geography boys visited Queen Victoria Market to investigate patterns of use by patrons and reasons that they visit the market. In particular, they were looking at why tourists might visit the market and how well they thought the market catered for tourists. The boys set off on the train, arriving at Queen Victoria Market at 11am where they were met by their tour guides who showed them around the market and gave them valuable insights into how the market operated. They also talked to some stall holders. The highlight of the day was the Foodies Tour when the boys got to taste lots of deli items like cheese and dips some exotic fruits. A great day was had by all. Here are the Boys taste testing in the Deli section of the market. This year 7 boys from BGS competed in the Australian History Challenge. 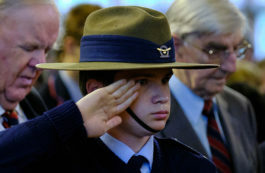 The competition is a national competition where students are tested on their understanding of historical skills and concepts against the Australian Curriculum standards. A select group of students from the Year 7 History Club competed in the competition and battled against students from around Australia (10,000 in Year 7 alone). This is the first time in recent memory that we have been involved in the competition and there were some fantastic results. Of particular note was the performance of Jenson Galvin who achieved a High Distinction, putting him in the top 5% in the country for the competition. After this year’s success, we aim to invite a wider group of students to participate in the competition next year. Congratulations to all the boys that took part. Fortnite… what is it exactly? Chances are your son has either mentioned Fortnite or is playing it with friends every chance he gets. So what is this game and should you be concerned about it? The short answer to this question is that you shouldn’t be concerned about Fortnite (in general), but should be concerned about your son’s technology use as a whole. Firstly, here is a quick introduction to Fortnite. Fortnite is a strategic adventure game that was released mid last year and is now available on a variety of gaming platforms. The premise of the game is that a storm has wiped out 98% of the earth’s population, and the player’s role once dropped into the battle zone is to build structures to gain an advantage over others, gather resources and kill everyone to be the last person standing. While the game is violent by design, it utilises cartoon-like characters. There is no blood or gore and when players are ‘killed’, they simply evaporate into thin air and disappear. The game does have an M rating and an age rating of 12+, and is not suitable for primary-aged children. By design, Fortnite is highly addictive. Balance your son’s game play with his homework, chores and other commitments. Fortnite has a chat feature that allows players who are in the same team to talk to each other. In environments such as these, bad language is commonplace. This feature can be turned off. Fortnite is a free game, but does have in-app purchases. The average player spends $85, so it is important to be aware that this can occur and to monitor your son’s usage. One of the best ways to understand more about Fortnite is to ask your son to tell you about it. While you may be concerned about how much he is playing Fortnite, this will be a perfect opportunity to examine how much time he is spending using technology in general. Take the time to negotiate with your son a healthy balance. If you would like to find out more about Fortnite, visit these links below. Professor Martyn Hook, Dean of the School of Architecture & Urban Design at RMIT delivered an informal information session on Architecture, Design, Art, Media and Communication this week. He spoke to students interested in a design course post Year 12. Martyn spoke about the numerous opportunities RMIT offers students including Communication and Interior Design, Games and Animation Design. The boys were also very interested to hear about the newly developed medical area of design – advancements in 3D printing of hip or knee replacements. Interview and application tips were given for the selection process and details of the syllabus. It was a great honour to have Professor Hook pass on his expertise and we thank him for his visit to BGS. Two of our BGS Year 10 debating teams finished top of the ladder in the Brighton region of the C-grade DAV debating competition this year. Congratulations to Team 1 (Joel Tyler, Sam Banfield, James Sherborne, Charlie Durkin, Liam Konidaris, Andrew Wang and Nik Vakirtzis) and Team 2 (Nate Hollis, Ben Sexton, Matthew Ross, Sky Wu, Mac Mclachlan, Billy Pearson and Larry Li) for their achievements in the regional competitions and to Ms Dunsby and Ethan O’Brien for supporting and mentoring the boys throughout the season. Both teams won four of their debates in the Brighton region, with Liam and Billy being awarded best speaker twice and Charlie, Sky and Andrew achieving best speaker once. As a result of their success, the teams gained entry to the finals series of the competition and debated against other high calibre teams in a playoff on Wednesday 22 August. The topic for the playoff debate was, ‘That the school curriculum should be developed by students. BGS Team 1 debated the affirmative against Kilvington Grammar and BGS Team 2 debated the negative against Mentone Grammar. All of the boys spoke with confidence and enthusiasm despite finding the subject matter difficult. Unfortunately, neither team was victorious on the night, but the boys are commended for their efforts this year and we look forward to more success from these boys in the future. This Tuesday BGS hosted book club with Firbank in the Urwin Centre Library. We discussed the book Wonder and got to hear a variety of perspectives. It was great to see the boys catching up with old friends and meeting new ones. If you haven’t read Wonder yet, or seen the movie, we would highly recommend it. We are selecting our own books for our final book club of the year and looking forward to sharing during term 4. The Library Committee, with Jason Gu in Year 10 at the helm, organised a fun and popular Chess competition in our Library. Due to its popularity, it ran over two lunchtimes, starting on Friday 31 August. Participants on this day included Yali Lin (Year 10) who beat Lionel Wang (Year 11), Patrick Liddle (Year 11 ) who beat Aymeric Fabre (Year 10), and Lukas Giannotos (Year 11) who proved too strong in his moves against Kieran Farrell (Year 11). The winners returned on Tuesday 4 September for the final games and the overall victor was Yali Lin. Spectators provided advice, the Library staff provided sweets and the players entertained us with their masterful skill. Congratulations Yali and well done to our Library Committee. Last week’s inaugural Year 7 BGS/FGS Big Breakfast was an overwhelming success. A combined 270 Year 7 boys and girls enjoying a hot cooked breakfast and a range of activities. The heavens opened, but Prefects from both schools had an array of indoor activities planned that had everyone engaged and socialising throughout the morning. Thanks must go to the very impressive Prefect group and the enthusiastic staff that assisted on the morning. Given the success of the new concept, we look forward to the Big Breakfast returning in 2019! Jared Furtado is Director of Music and Head of Choral – but he’s passionate about many things. What gets you out of bed in the morning? Two mornings a week: my amazing choirs – those boys are legends. The other five mornings – my alarm! Where did you go to school? Perth Modern School, Subiaco, WA. It is Perth’s first school dedicated to music education and funded by the government, and a program based entirely on Kodaly methodology – all about singing and aural training. I thank my lucky stars I was fortunate enough to attend Mod. Given a day to yourself, what would you do? Gym, movies/watch whatever series is going (Handmaid’s Tale, Mystery Road and Killing Eve have been the latest – I’m a strong advocate for the ABC and SBS), friends, FaceTiming family, cooking … and good food. What is on your wish list for your time at BGS? Seeing more staff and boys singing with confidence and passion, and more boys viewing singing and performing as a show of strength of character. What’s the most recent app you downloaded and have you used it? Bureau of Meteorology (BOM) – and yes – all the time! Keeping an eye on the radar is imperative for moving between all areas of the School! Bright and early training session for our Year 8 Water Polo team. The boys enjoyed jumping in our warm pool for their training. The session finished with a friendly game in preparation for Saturday as the 2 BGS teams are playing one another at 9:00am in Haileybury!